Fairground, me on the booth, a fan of the University of Hagen and visitors. 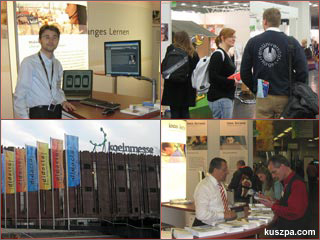 didacta 2007 in Cologne will bring together the leading decision-makers from all areas of education; sounds good to me, so I went for the first time to this fair. I had the opportunity to present our work on Mobile Learning on the booth of the Federal Institute for Occupational Safety and Health. On the first day I didn’t find any other Mobile Learning exhibitors, but I will make further expeditions in the next days… Stay tuned!